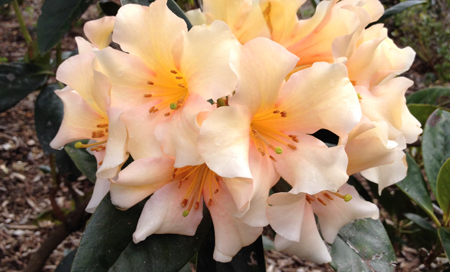 We have had a particularly dry summer, so those large, older rhododendrons would benefit greatly from a deep soaking as the flower buds for the coming spring are developing. If your deciduous azaleas have not yet shown signs of mildew, an application of fungicide will protect the foliage and allow it to take on its typical autumn colouration. The Australian vireya “Lochiae” makes a wonderful show of colour with its rich red blooms during March. It is well suited for growing in a container. 1. “Madonna” – A large semi double white. Makes an ideal pot plant. 2. “Goyet”- A very large double red. 3. “Hinomayo”-a dwarf Kurume, with soft pink flowers produced over a long period. Sasanqua camellias provide wonderful autumn displays. “Bert Jones” is a strong, upright grower with large semi double pink flowers. “Gwen Pike” is a compact, small leafed variety with shell pink flowers. “Betty Ridley” is a reticulata hybrid with formal pink flowers. Well worth growing. It is important to lift the canopy of shade trees above rhododendrons and azaleas by removing low branches, because it is essential to have light and air flow available to plants to lessen the likelihood of fungus diseases and to encourage the development of flower buds. Systemic insecticides such as “Confidor” help to control lace bug and weevils.